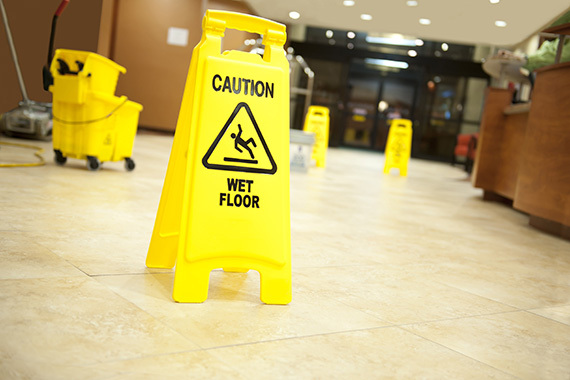 No matter what kind of work environment you are in — retail store, office, school, job site or manufacturing facility — slips, trips and falls happen everywhere. In fact, falls are the leading cause of death in construction and, in general, only motor vehicle incidents cause more worker fatalities. Each year, approximately 230,000 workers are injured in slips, trips or falls, costing businesses an estimated $70 billion, according to the Occupational Safety and Health Administration (OSHA). The good news is that in most cases these injuries are entirely preventable with some careful housekeeping, the correct equipment and appropriate training. According to the Centers for Disease Control, the leading causes for workplace falls are slippery and cluttered or unstable surfaces, floor or wall holes, poor lighting, incorrect positioning of ladders and misuse of safety equipment. Plan ahead – Know ahead of time when work needs to be done at heights and determine the safety equipment you will need. Provide the correct equipment – Have the appropriate fall protection gear for the equipment you are going to use such as scaffolds and ladders. Also, check the equipment to ensure that it is in working order. Train everyone to use the equipment – The best safety equipment can’t do its job if workers don’t know how to use it. Be sure to provide enough training in advance so that your employees know how to use ladders, scaffolds or harnesses. Finally, remind employees to be aware of their surroundings and to walk and work at a pace that is appropriate for the surfaces they are on. In addition to these basic fall-prevention strategies, OSHA has developed safety rules for working at heights, that every employer must know and comply with. TSS is here to help you make sense of the OSHA regulations and to keep your employees safe. It’s not too late to sign up for our Slips, Trips and Falls Webinar on Thursday, March 28. Or, feel free to contact us with your questions about this topic slips at info@tss-safety.com.